A moderate walk with one steep flight of steps to reach the canal. There are good views north across Abergavenny and the surrounding hills. One point of interest is Llanfoist Wharf which was built to transfer pig iron arriving on the tramway from Blorenge onto the canal for shipment to Newport Docks and thence around the world. 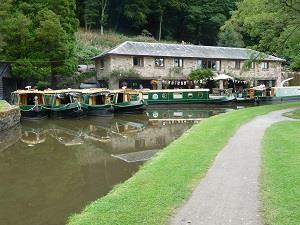 It is now the base for a canal holiday hire boat operation.